I wrote a passionate love letter to Rose’s Luxury in November 2013. The restaurant was relatively new at the time, but already receiving plenty of accolades. 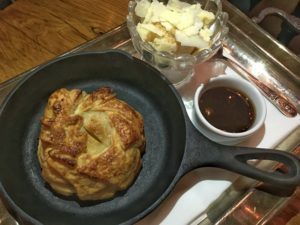 Rose’s Luxury and chef/owner Aaron Silverman have since been honored with numerous awards and recognition, including a Michelin Star and a James Beard award for Best Chef Mid-Atlantic. It was my favorite DC restaurant until last summer, when it moved to second place just behind Chef Silverman’s stellar Pineapple & Pearls. My visits to Rose’s Luxury now number in the double digits. And while DC continues to benefit from an influx of exciting new restaurants, my heart still races every time I walk through the door at Rose’s. That said, I have graduated from the early infatuation stage into a deeper, more mature relationship. 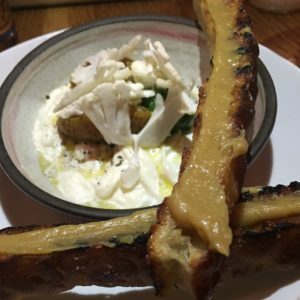 Where I once felt that servers who waxed rhapsodic about the restaurant were essential to my experience, I now appreciate their enthusiastic but slightly more low-key approach. I take comfort in the familiarity of certain fixtures on the menu like pork sausage with lychee salad, or the always-satisfying family style smoked brisket. I don’t have to order these dishes at every visit, but I’m grateful to know that I can. Pasta dishes at Rose’s Luxury are consistently reliable and always delectable. 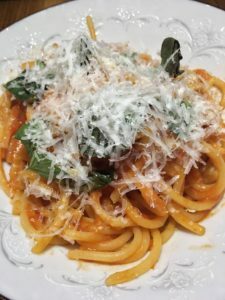 Currently on the menu are two excellent choices- farro reginetti with kale and mustard greens and spaghetti with tomato, chili, basil, and parmesan. Stracciatella with beets and kale pesto is served with giant bread sticks. This is the dish you want to enjoy sparingly so you don’t spoil your appetite, but you can’t help but take another bite…and then another. Of course, when it comes to long-term relationships, it doesn’t hurt to add a touch of luxury to spice things up. 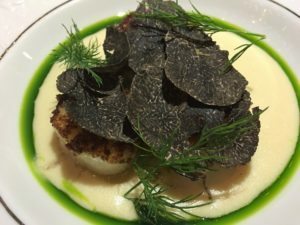 On my most recent visit, I gush over an off-menu special of Cape Cod scallops with Perigord truffles atop potato puree. 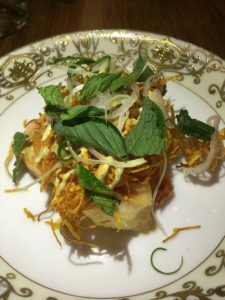 Crispy sweet potato with shrimp, curry, and herbs is a bright, texturally diverse dish that serves to further fan the flames on my enthusiasm. While the more demanding Pineapple and Pearls rises in acclaim, Rose’s Luxury still garners Chef Silverman’s attention. He can be spotted racing between his side-by-side restaurants, dividing his time between kitchens. He tell us that desserts are particularly good right now, a pitch that’s irresistible. Cinnamon apple pie and Innkeeper’s pie stuffed with yellow cake punctuate a completely gratifying meal. The no-reservations policy remains a turn-off for some, but there are ways around it. In December, Rose’s offered gift certificates which included a guaranteed reservation in January or February. Hopefully the success of the effort will guarantee similar offerings in the future. A table for 6-8 people can be reserved three weeks in advance. This is the perfect introduction for those who want to be assured a seat at the table. When I need to escape from the thorny issues of the day, this is where I want to be. Rose’s Luxury is in full bloom, and my devotion is as steadfast as ever. Roses Luxury, 717 8th St. SE, Washington D.C.